The sail locker is in the bow (center of photo). 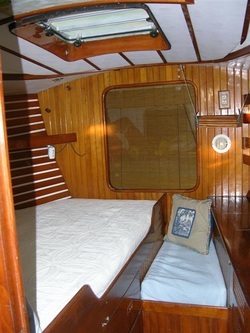 The sail locker is located just forward of the Master Cabin. It has a 3ft by 3ft opening making getting large items in and out easy. We even have two mountain bikes strapped to the sail locker ceiling! We use a wooden blind identical to the one over the pilot berth in the salon to obscure the view of these items. Bike spares, pump, two sets of panniers, 2 helmets. Getting the bikes in was important to me as many of the books I had read indicated how useful a bike was, and they were, plus a fun way of exploring. My ultimate solution was to remove both wheels and pedals then using ropes around both the frame and brackets on the ceiling, pulley them up one at a time and secure them to the ceiling. This had the advantage that I had full access to everything in the locker and access to the Chain locker through a hatch at the front of this locker, without disturbing the bikes. The sail locker has two levels, the bottom level is shaped in a "V" as this contours the bow of the boat. It is reached via a hatch in the floor of the sail locker. It was in here that I stored the bike wheels and other bike paraphernalia.